Gov. Peter Shumlin delivers his third inaugural address. Gov. Peter Shumlin had to sneak out the back door of his own inauguration. That should tell you a thing or two about how politically weakened the East Montpelier Democrat finds himself as he settles in to a third two-year term. Blocking Shumlin's path from the dais of the Vermont House to its front entrance Thursday afternoon was a group of Vermont Workers' Center activists irate over his decision three weeks ago to scrap his long-promised single-payer health care plan. After the governor concluded his inaugural remarks, the protesters sat down in the center aisle and would not leave the House for more than five hours, at which point the Vermont State Police arrested 29 of them. 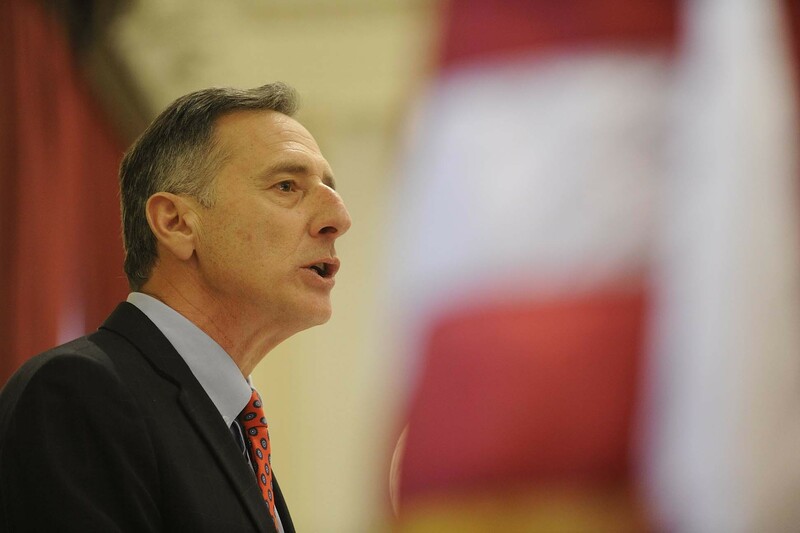 Left-wing health care advocates weren't the only ones standing in Shumlin's path. Earlier in the day, 69 members of the Vermont legislature took the remarkable step of voting against returning him to office, despite the fact that he won a plurality in last November's election. To be sure, Thursday's vote wasn't even close, nor did it surprise most political observers. In a secret ballot, 110 legislators picked Shumlin over Republican Scott Milne, who came in a close second last fall. But given the partisan makeup of the House and Senate (104 Democrats, 62 Republicans, eight Progressives and six independents), it's safe to assume that the vast majority of Republican lawmakers — along with a handful of Ds, Ps and indies — bucked 150 years of precedent in order to send a message to Shumlin. In his inaugural address, delivered just hours after the vote, the governor said he'd heard their message — along with the message sent by Vermont voters — loud and clear. "Thank you all for making it possible for me to give this speech. I'm humbled. I'm grateful. And I can't tell you how much it means to me from the bottom of my heart," Shumlin said. "I heard clearly in the election this fall that Vermonters expect more from me and from the state to help improve their lives." To that end, the governor promised to deliver what he called, somewhat unimaginatively, an "agenda for progress." It would include, he said, proposals touching on workforce development, education finance, health care, child protection and drug addiction. But then Shummy did something funny: He declined to actually outline said agenda. Due to "the enormity of the issues that Vermonters have called upon us to tackle in this biennium," he explained, he would wait until next Thursday's budget address to outline most of his plans and, instead, focus on just two issues in his inaugural: energy and the environment. Precisely why Shumlin chose to backload the bulk of his political promises wasn't immediately clear. After the speech, his staff did not respond to a request for an interview. But there are a couple obvious possibilities: One is that he simply wasn't prepared to offer solutions to the tremendous challenges facing Vermont state government. Maybe the dude just needed a one-week extension. After ditching single-payer just three weeks ago, perhaps he found himself scrambling to find a new centerpiece to his legislative agenda. That would explain the cobbled-together nature of his proposals to expand renewable energy generation and efficiency programs, and to clean up Lake Champlain. More likely, he was aware that pretty much any realistic proposal to address the state's projected $100 million budget gap or to control the rising cost of education or health care would be politically unpalatable. On a day in which he found himself limping across the finish line to a third term in office, perhaps he just didn't want to provide any more fodder to his critics. Shumlin's rhetorical pivot to battling toxic algae blooms on Lake Champlain was remarkable given how little political capital he has invested in the issue over the years. His commissioner of the Department of Environmental Conservation, David Mears, is well-respected among those devoted to clean water, but Shumlin himself has consistently shied away from the issue since he took office four years ago. He has battled advocates and the Environmental Protection Agency alike over how much money to invest in the mess and delayed identifying funding sources. So when he said Thursday that the state was "losing the battle for clean water," it was difficult to remember when he last donned his armor to go to war over it. There's no question Shumlin has focused more on renewable energy in his tenure, winning plaudits from environmentalists and those in the generation business. But he has also alienated other enviros by supporting the Vermont Gas pipeline, opposing state divestment of carbon-spewing companies and championing the consolidation of the state's two biggest utility companies. Shumlin has made a practice of using his inaugural addresses as pivot points. Two years ago, he shifted his focus to education and welfare reform. Last year, to much acclaim, he seized on combating drug addiction. It remains to be seen whether the liberals Shumlin has alienated in recent months will see this latest pivot as genuine — or just another tack away from the unpopular issue of the moment. And it remains to be seen whether Shumlin will follow through on the commitments he made Thursday or push them aside when the business of governing grows tough. Environmental advocates may want to check in with single-payer advocates to see what they think. Shumlin did make one thing clear in his inaugural address: that even as electoral rivals start spreading their wings and commentators pre-write the governor's political obituary, he's not quite ready to call it a day. "From jobs to the environment, I have an agenda for progress that I will partner with you to fulfill," he said, "in this term and beyond." And beyond? That doesn't sound like a guy who thinks six years in office is enough.